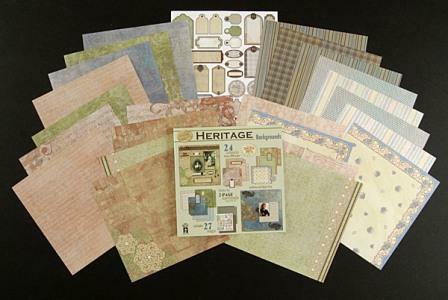 Gorgeous heritage papers. 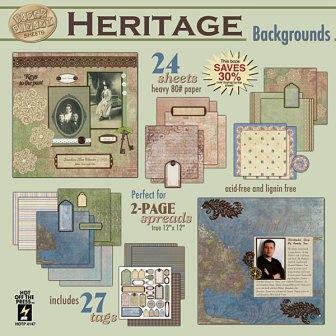 This stunning heritage collection includes papers patterned with softly-collaged designs, including a lace-border set, music notes, vintage fabric, flourished borders and collaged ledger paper in versatile muted colors so it’s a snap to match your photos. You’ll have something for masculine, feminine and family tree photos. You also get a sheet of 27 tag cut-outs! But this collection isn’t just for scrapbook pages—these designs are perfect for cards, Sara’s Surfaces™ and other paper crafts too. With 24 sheets of 12”x12” paper printed on our new heavier-weight 80# stock, you’ll have just what you need for beautifully coordinated heritage paper crafts. Paper Size: 11.75" x 12"